Dudleya farinosa goes by the common names of Bluff Lettuce or Cliff Lettuce. Not surprisingly Dudleya farinosa is found along the coast. Dudleya farinosa grows from 6" to 12" tall and creates a slowly spreading colony. Dudleya farinosa comes in both green and silver forms in both cases the leaftips are red. Dudleya farinosa blooms from late Spring into Summer, red flower stalks add to the effect. 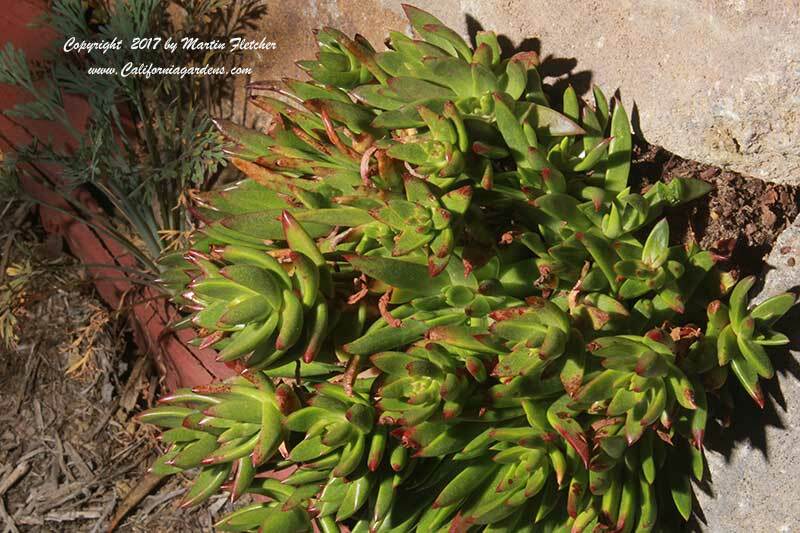 Plant Dudleya farinosa in sun to light shade near the coast providing more shade if the garden is inland. Dudleya farinosa requires good drainage, hark back to the cliff idea. And it is from California so it has to be pretty drought tolerant too, water every couple of weeks to once a month. Dudleya farinosa is winter hardy to 20-25°F. This planting of Dudleya farinosa is on an east exposure in a gap made in a dry laid wall. Colony of red tipped green rosettes of Dudleya farinosa known as Bluff Lettuce or Cliff Lettuce. High resolution photos are part of our garden image collection.